with a microphone built-in are the ultimate office accessory. Giving you the freedom to make calls hands-free, headphones with a built-in microphone are ideal for work environments that require you to multi-task. Whether you need to use a computer as you talk, jot down notes or search for a physical document, both wireless and wired headphones with a mic give you the freedom to search, move and complete your task efficiently. With a headset with a microphone, you’re not tethered to your phone. If you prefer to be able to get up and walk around as you talk, perhaps when on a conference call to simply help you process your thoughts, the flexibility to do so is there with our headsets. In this range, you can choose from headsets in both one-ear and two-ear styles. 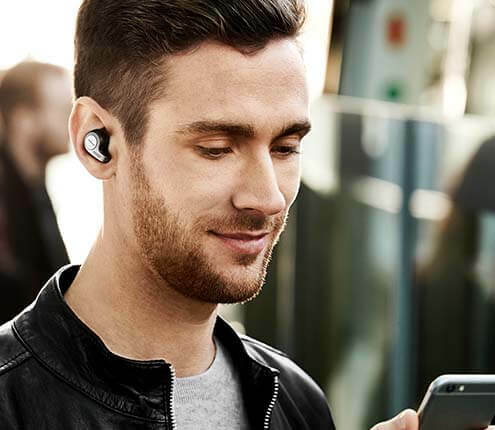 One-ear styles let you keep in touch with the environment around you, as well as the person you’re calling, while two-ear styles come with the option of having noise-cancelling functionality – perfect when you really need to concentrate and be free from distractions. 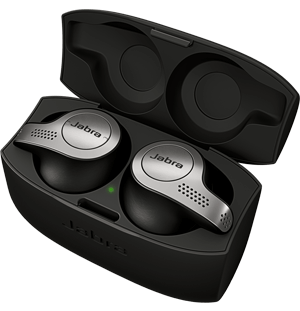 Communicate efficiently with our practical headsets, make sure your caller can hear you with excellent sound quality, and keep your focus with noise-cancelling variations, choose a headset with a microphone to suit your working style with Jabra. best-in-class noise cancellation to enhance concentration and productivity in the open office. A wireless headset with superior Active Noise Cancellation and integrated busylight to enhance productivity. With dual Bluetooth® connectivity to two devices, the Evolve 75 also has a wireless range of 100ft/30m.